You might be right, I may have described two issues, although it seems to me they are related. 1. Zoiper not woken up, which means calls return busy. 2. Zoiper woken up with delay, which means it starts ringing but the calling party has already ended the call (with busy signal). This time the RINGING packet might be sent with a delay, as elkato described. 2. starts ringing with delay and the calling party shows busy. In any case, there is definitely a difference in the delay between dialing and ringing when the device screen is on (no delay) and the screen is off (variable delay). What exactly is done in the background? What does Android do to the Zoiper app, that the background mode is supposed to fix? Edit: just wanted to add that the issues described here DO NOT happen if I keep the screen on all the time. I actually use an app Automate to keep the device screen on constantly, and since then I encounter no issues. Of course, battery is affected, so it is not an optimal workaround. Both issues should indeed have been fixed with the new background mode (constant wake lock), it sounds like your phone does not allow zoiper to be active in the background at all. (or the network goes away). When an application is sent to the background, android will normally put the application to sleep (stop giving it cpu time). The alarm version puts an alarm clock every 30s and then we use a wakelock to force zoiper to be alive for a little bit to reregister and check for incoming calls, after which the application will be put back to sleep. (the exact time zoiper will be awake for depends on the phone). The constant wakelock forces android to keep providing cpu cycles to zoiper, similar to how playing music in the background would work. Zoiper does not do anything other than reregister every now and then and listen for incoming calls on the udp / tcp sockets. But why did it work in the past and now, since about 6 months in my case, it does not any longer? I set all battery settings in MIUI, all locks to not stop the app, but I still miss most of the calls. Wakelock mode is not an option, because the phone never sleeps and battery time decreases from 2 days to 0.5 days. Does the keep wakelock work on your phone ? (Aside from using more battery). Yes, it seems to work. As I told my phone begins to ring immediately when I push the power button during making a call to my phone. On the calling side I do not hear any ring, but when I push the power button Zoiper starts to ring and I also get a ringtone on the calling side. So Zoiper obviously gets the call, but is not able to ring in these cases. Push will not help me, because my SIP-server is on my DSL-router (Fritzbox). On the other hand I don't understand why push should be a better solution than the current version or the old one in Zoiper 1. Something always has to listen, either to incoming calls or to a push notice. So what's the deal? I also want to add, that at the moment I use Grandstream wave as additional VoIP app, which ALWAYS rings reliably without using wake lock or anything else I would see in battery usage. So since some weeks I use Grandstream wave to wake up the phone on incoming calls and then Zoiper starts ringing, too (a least most of the time). I don't use GS wave as main VoIP app, because it has some dial rule issues, e.g. can't ignore brackets and spaces in numbers stored in address book, but it is a known issue they are working on. As I like Zoiper I really would like to stay with it, but without Zoiper ringing reliably on ALL incoming calls it is a complete nogo, especially as VoIP app. And as we can see here, there are a lot of people having the same issue! Look at the recent Google play store comments. Please install Grandstream wave by yourself and test it, perhaps you could find out what they are doing to manage its functionality. Regarding Pholio's comments, I have also tried using Grandstream Wave before, but it worked less reliably than Zoiper. Not only did I have the same issue, but sometimes it happened that Wave showed multiple incoming calls at the same time, while showing busy on the caller side. kreshnik, did you use Zoiper now with wake lock set? Of course it works this way, but did you check your battery consumption? Do you use Zoiper beta? And what is DSCP option? I do not notice any significant battery consumption. Are you using UDP? That, from what I've read, uses more battery. It might also have to do with the device. I use the Samsung Galaxy A3 device. As it shows a full line at Wi-Fi with Zoiper wake lock also the Awake line is full. That means the phone is not sleeping and always consuming more battery. If you do not see any difference perhaps your phone already has another app which does prevent Android from sleep. 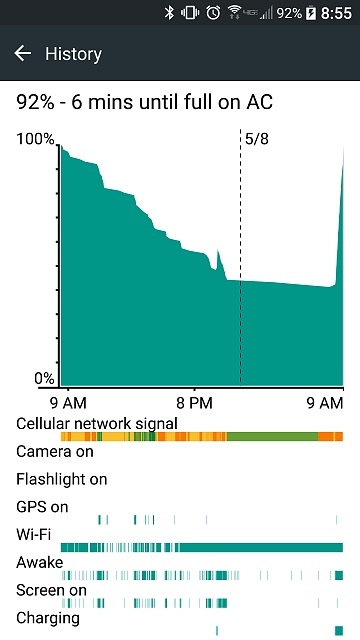 I notice a drain in battery using Zoiper wake lock. And I don't see any reason why I should use a wake lock, because some months ago Zoiper worked fine without that and other apps do, too. With Galaxy s6 (Android 7.0) there is no issue with incoming calls! The problem is with Galaxy j5 (Android 7.1.1) and Xiaomi Redmi 5A (Android 7.1.2)! The call comes in silently , with no ringing , until i press the power button ,and wake the sreen! After that , the phone is ringing normaly! There is nothing we can do if the phone does not wake up Zoiper on time. It is beyond our control. The constant wakelock will use more battery for sure. Wait a couple of weeks and we should have push support. Again: I use Grandstream wave and it DOES wake up the phone on all imcoming calls, so finally Zoiper also rings on this call, because wave woke the device. Grandstream wave does NOT use a constant wakelock! So I do not understand why Zoiper is not able to do it the same way? Also in the old API it mostly worked fine. It seems, that Zoiper should think through his API selection/realization again. Why you don't test it by yourself?